Here in the Midwest, decent seafood is hard to come by. When you find some, and especially at a decent price, you want to make the most of it. I have found some individually frozen Tilapia fillets that are of very good quality from a company called Wholey. Since then I have been looking for recipes in order to exploit my find. This one is very tasty and has an added bonus. It takes only 30 minutes start to finish. Its simple enough that my 14 yr old wanted a hand in making it. This makes four servings. In my household, you might want to increase this by half again. On medium heat, add olive oil and chopped onion, saute for about 8 minutes until tender, then add garlic and cook 2 minutes more. Add undrained tomatoes, oregano, basil, and crushed red pepper. Simmer uncovered for 5 minutes. Add olives and stir in. 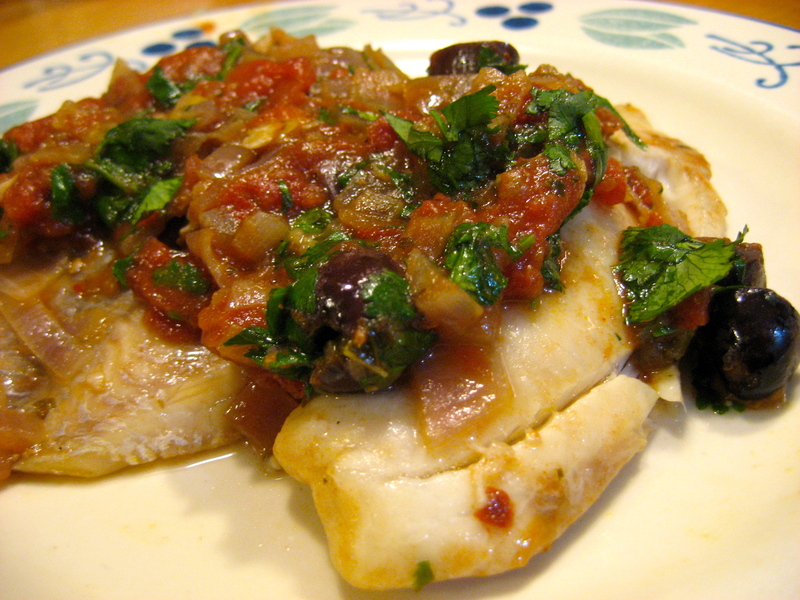 Top sauce with tilapia fillets. Cook, covered, 8-10 minutes until fish flakes with fork. Remove fish and simmer a couple more minutes to thicken sauce as desired. 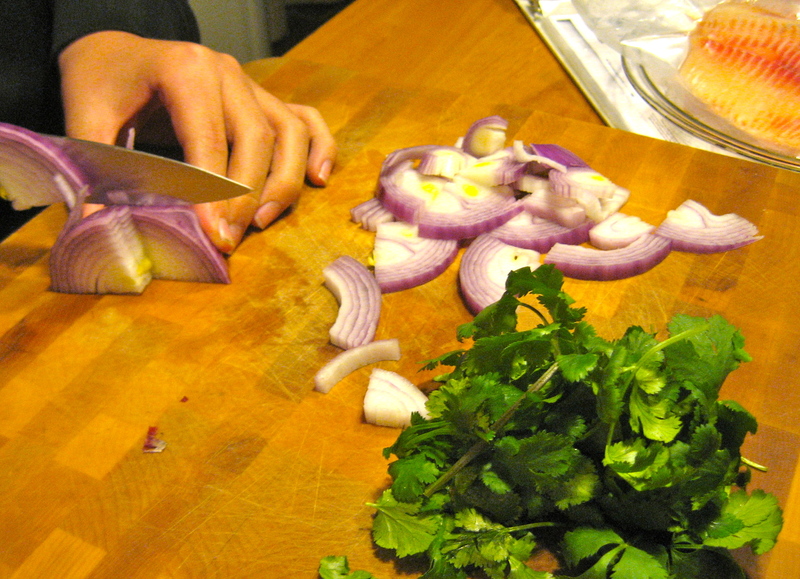 Turn off heat, stir in parsley. 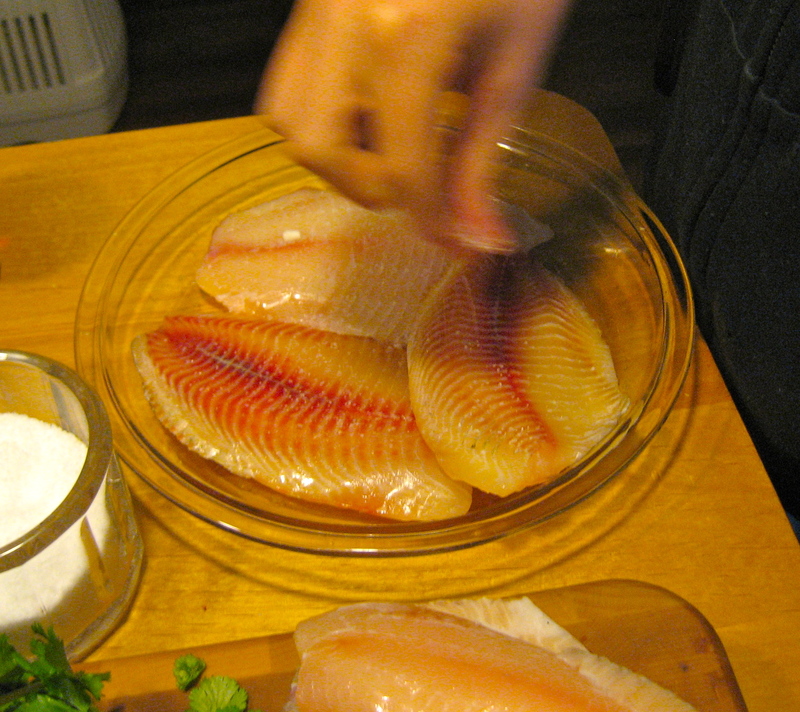 To serve, spoon sauce over fish. Enjoy! Ooooh puttanesca! Yummy! Thanks for posting. Putting these on the “to make” list. I love tilapia too- a surprisingly sustainable and freezable fish! In Kansas, we rarely get good seafood. I am loving my new find.